After checking out a handful of factories on the geek tour in 2009, it was time for me to return to China to visit some of the factories that make goods for SparkFun. I've got far too many pictures and videos for one post so I'm going to break them up into three posts. This is the 3rd post - you can read Part 1 over here, Part 2 is here. On our 6th and 7th days, Louis and I toured a cable molding company, SeeedStudio and a PCB assembly house. 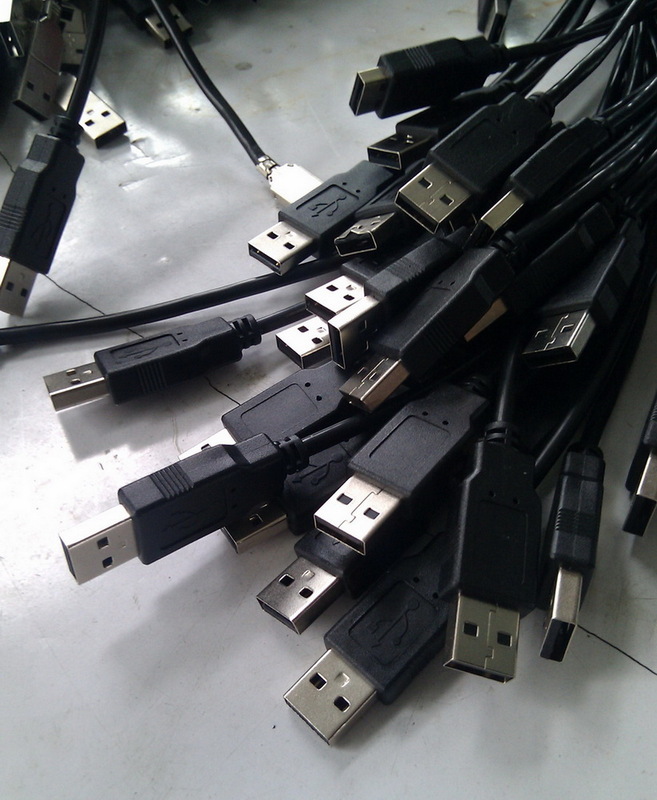 If you've used a USB, audio, IDE, SATA, or phone charger, you've used one of their products. I thought there was some magic to making cables. And while there are some neat shortcuts, cable making is actually what you'd expect: a lot of stripping wire and a lot of hand soldering. Starting with the raw cable, the outer-sheath is removed. The stripping machine was quite impressive (fast, and no nicks!). This large box is in place to keep the plastic bits from flying all over the shop. 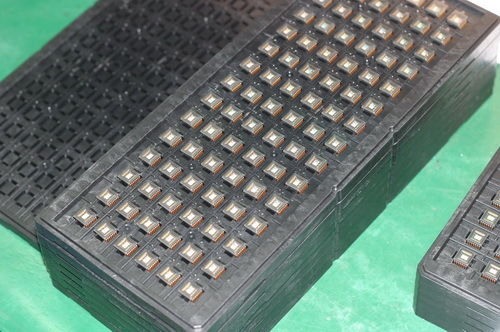 Next the connector (any type you can imagine) is soldered. The iron is permanently held in place, while the connector, wire, and solder are all brought together at the iron tip. Three things, two hands, I still can't make the math work. 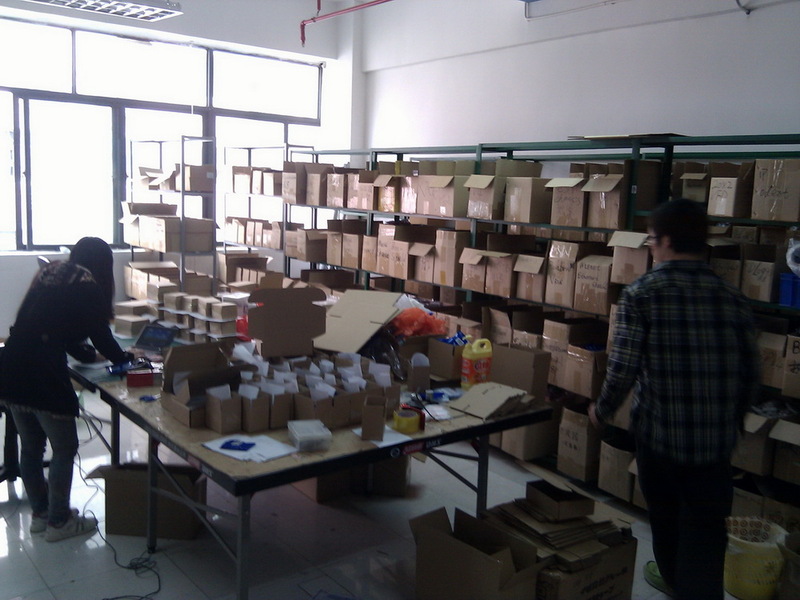 It was a small but very efficient assembly line. Can you tell what they were making yet? This is one of the 'short-cuts' I was talking about. Stripping wire and soldering I can do at home, but I do not (yet) have my own injection molding machine. 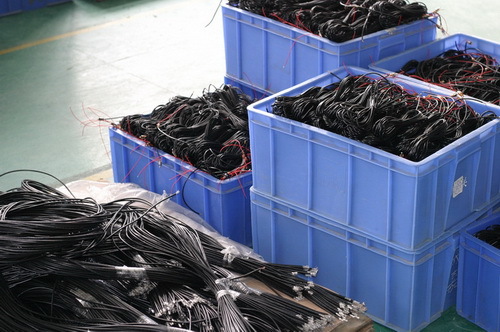 This picture shows the lower half of a mold, 4 copies, of a certain cable. 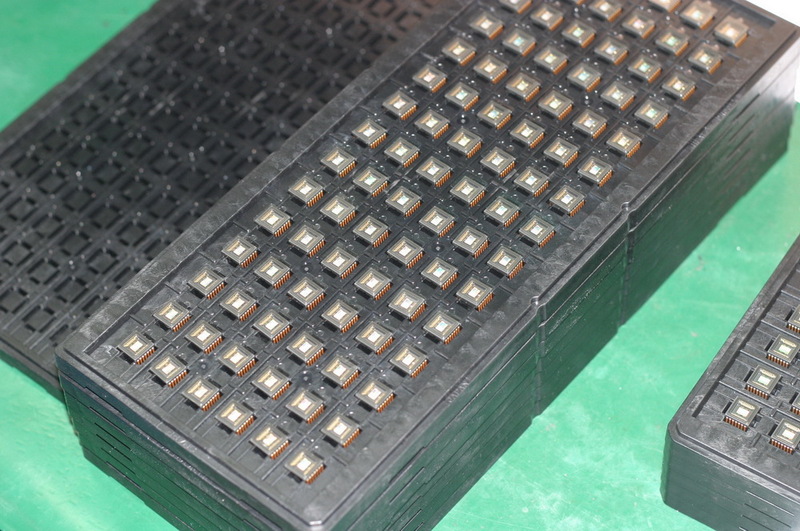 The wire and connector are placed into this mold, the mold clamps together, and hot rubberized plastic is pressed (under high pressure) or 'shot' around the connector and wire. This provides excellent stress relief and protection. No longer do we have screwed together cables, now everything is wonderfully injection molded. USB cables!!!!!! Ok, it wasn't that hard to tell. 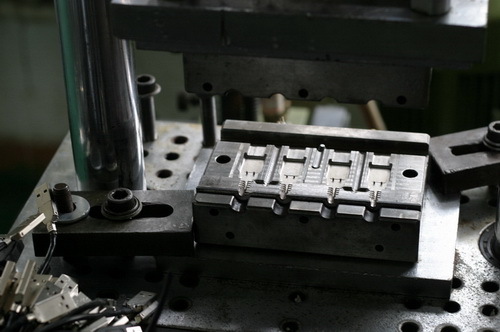 In this video (you may want to watch it in a larger window) they are molding ethernet cables (they had multiple production lines running during our tour). The main worker loads the machine with four bare cables, hits the two green safety buttons (you can't start the machine unless you've got your hands out of the way) and the machine begins injecting the plastic. While the machine is doing that, he loads a second die with four new cables. 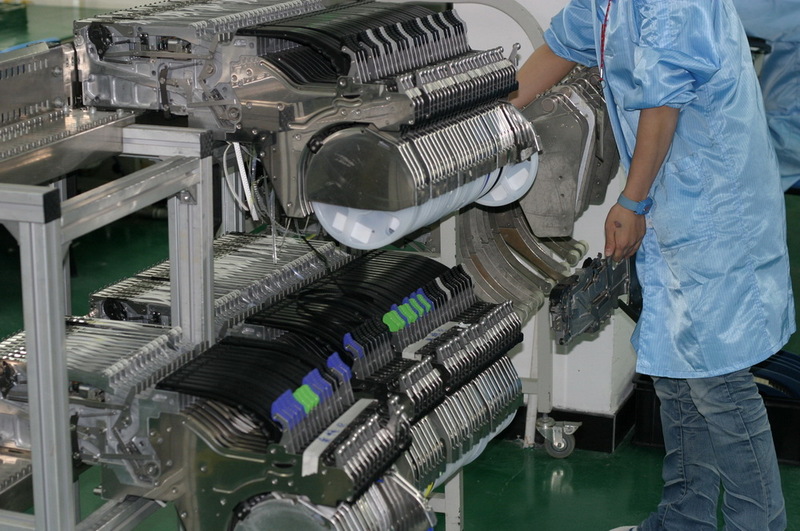 Once the machine is done, he removes the four cables and hands them to another worker who checks for quality and the process instantaneously begins again. These are some of the many different cable molds: DB9, RCA, iPod, ethernet, USB A/B/mini/micro, audio, HDMI, S-video, DVI, banana, PS2, DIN, SATA, ... you name it, they've molded something like it before. You may have to click on the above image to see, but that is an entire bin full of IC-hook caps. Yep, they make those too. Here is a rather long video (watch it in a larger window), but you get the sense of how quickly these workers can breakdown and setup for a new build. It's pretty impressive. Around 0:50, he adjusts the IR safety beam. He then takes a few minutes running 'test shots' waiting for the heater to bring the gigantic piece of machinery up to temperature. 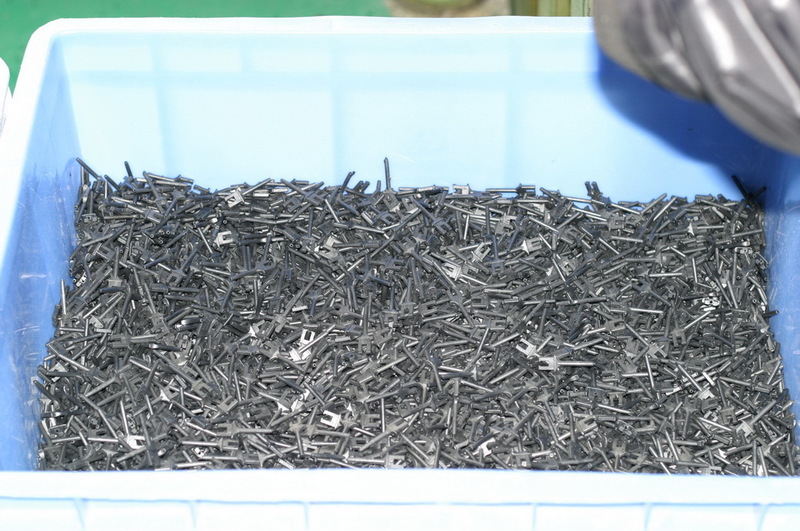 Once the machine is up to temperature, the plastic pellets (fed in from a hopper at the top) can flow freely into the metal molds. 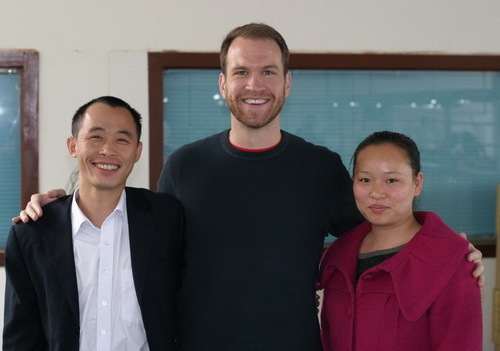 Jim, myself, and Irene. They took excellent care of Louis and me. 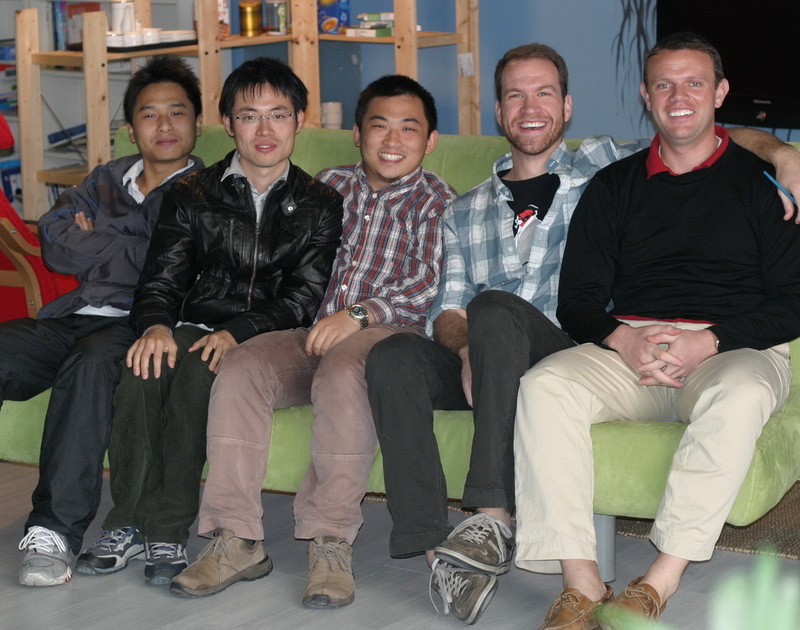 On our next to last day, Louis and I got to catch up with the crew at Seeed Studio. They've been operating out of Shenzhen for about 3 years and have been designing and releasing some pretty innovative products. From left to right: Edward, Steve, Eric, myself, and Louis. I swear this is what SparkFun looked like once upon a time. 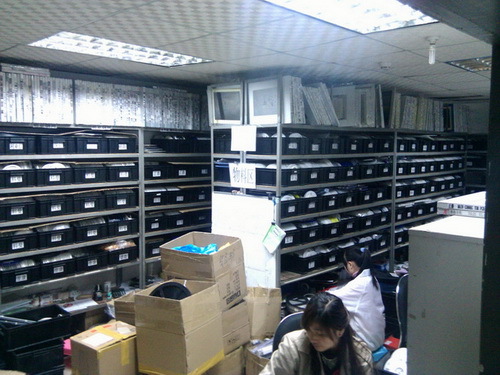 Shelves and boxes 'o inventory. We too were once small enough we could 'just know' where things were. I especially like the box labeled 'box'. Eric thought I was crazy for taking a picture of his closet but I again had deja vu. I swear our closet looked just like this not too long ago! It's amazing how similar the growing pains are between growing companies no matter the location or type. However, we've never had offices as nice as this! Eric then took us on a field trip. Trip is the wrong word - this PCB assembly house was across the street from their offices! I was more than a little jealous. Here's another machine I wish we had. This is not quite an automated solder paste stenciling machine. 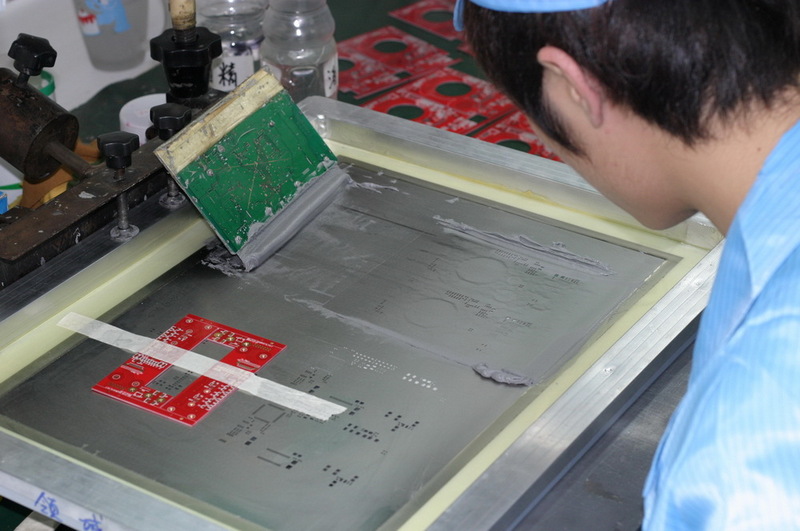 It requires a human to align the stencil with the board, but the actual paste application is done by machine. Tape and reels to feed the pick and place monsters. This is a manual solder paste station on a different line. I like how he used a PCB to reinforce the solder paste paddle blade. I thought this was genius! 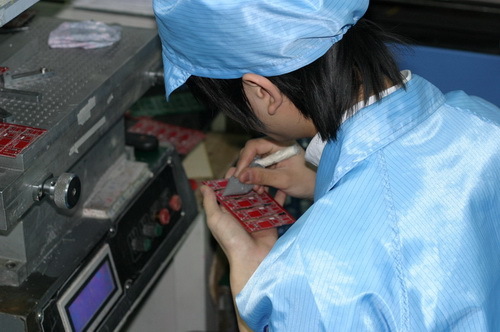 Applying solder paste like icing on a cake! Why didn't I think of that? There was the regular pick and place machines, but this line also used good old hand placement. Just like us! But we admittedly don't use such nice hair protection. I found this picture to be oddly humbling and ironic at the same time. 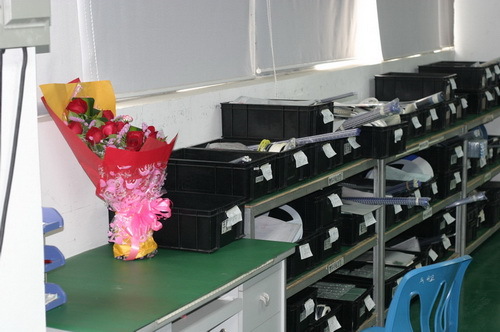 Everyone needs flowers from time to time, even people who work in electronics. This was one of the larger assembly houses we saw. I counted 12 lines across two floors, running at the same time building all sorts of different things. There was constant activity. Here are stacks of CMOS imaging sensors. Can you identify the functionality of the board without any parts loaded? It looks like mini-USB, flash memory, IC, 3.5mm audio jack, and a slide switch on one side. MP3 player perhaps? 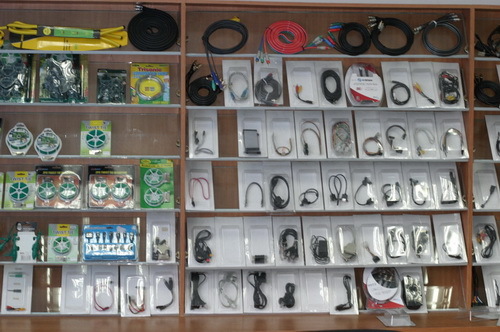 I enjoyed looking at the wide variety of widgets being built. I don't exactly know what this is, but checkout the triple stack of modules. 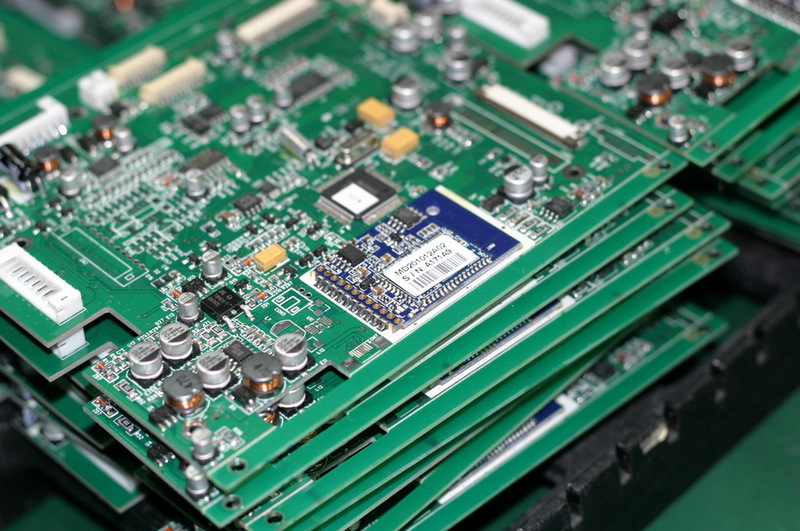 I count three PCB - There's ICs on a board, that is then soldered to a board, that is then soldered to a board. The economics behind this blows my mind. Some sort of video board. A whole stack of them. 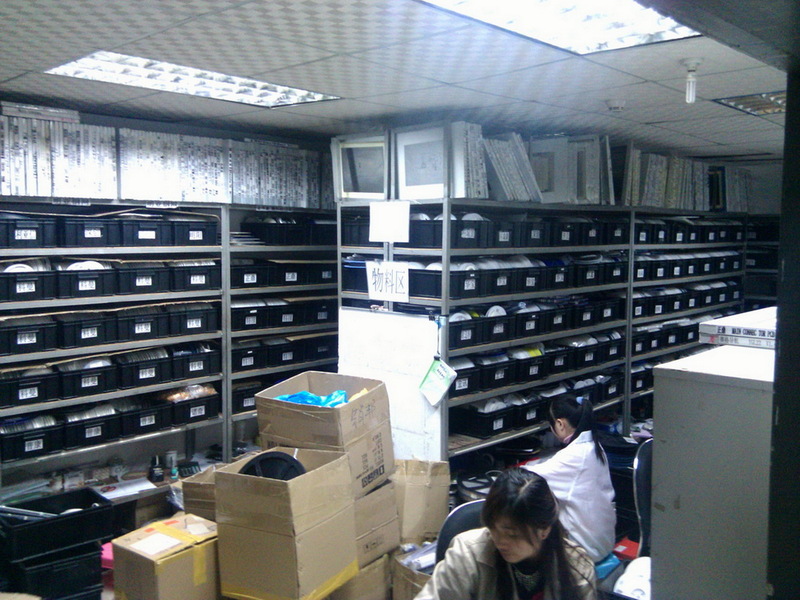 Here is the assembly house' inventory room. Massive amounts of reels of components. 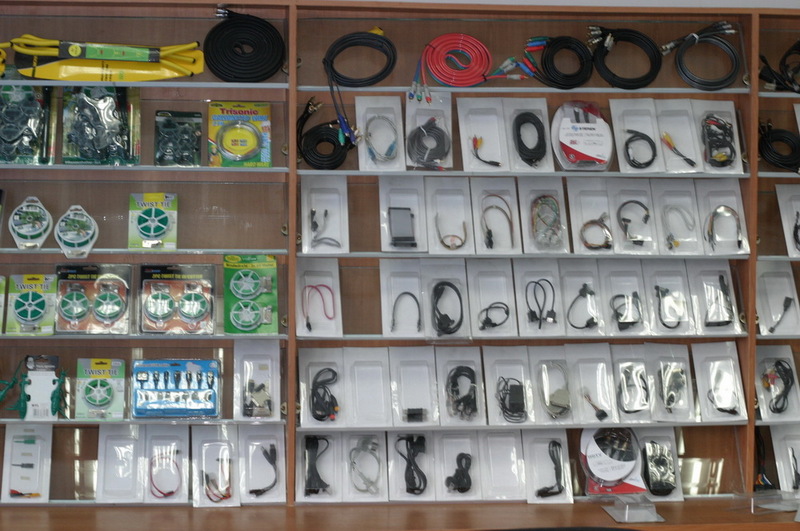 Smartly, the paste stencils (accessed less often) are arranged at the top of the shelves. This room was one of four. 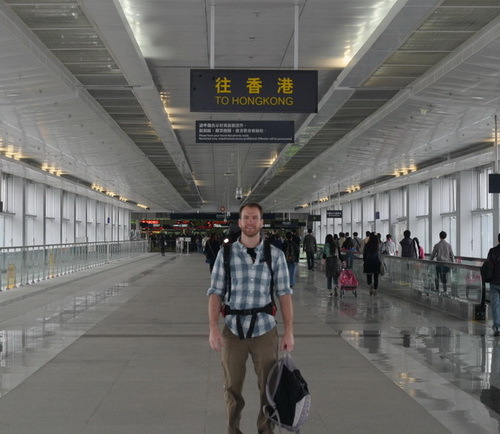 Finally, after many days of meetings, good food and new friends, Louis and I returned to Hong Kong. 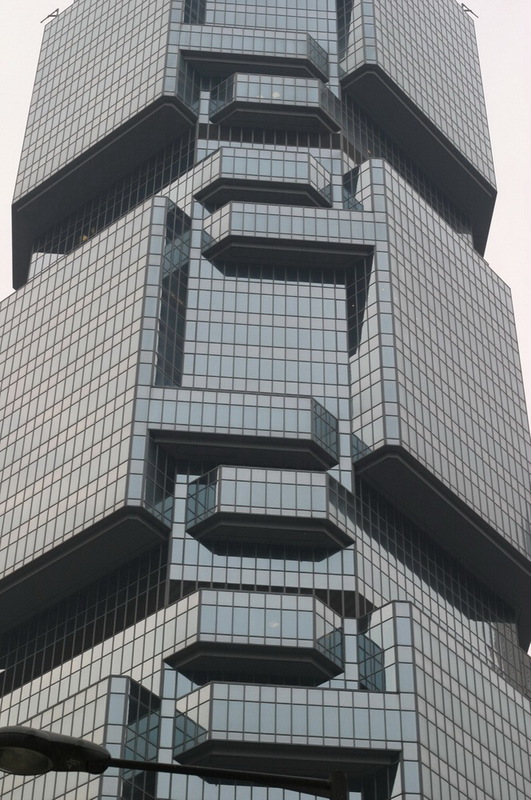 Hong Kong is a few years ahead of Shenzhen in terms of architecture. Beautiful buildings! Before we got on a plane for the 23 hour return trip, we had one last trip through Hong Kong night life. 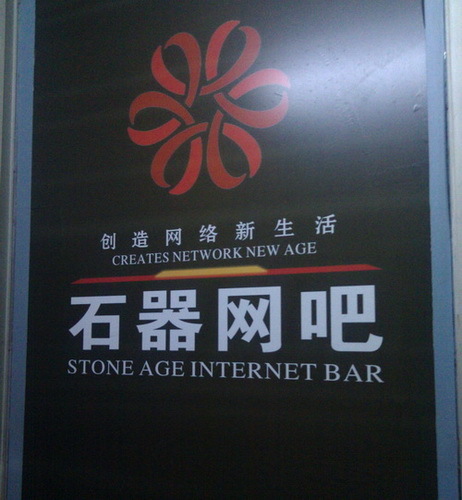 Another fantastically translated sign. If you ever get the chance (or think you need to see massive RGB displays), I highly recommend a trip to Hong Kong and China! Feel free to checkout the earlier posts Part 1 and Part 2 as well! ³é¨" means:"pass in and out the plant, please colse the door ". Grammatical Error: "the assembly house' inventory room" > "the assembly house's inventory room". Nice, glad you guys had fun over there! 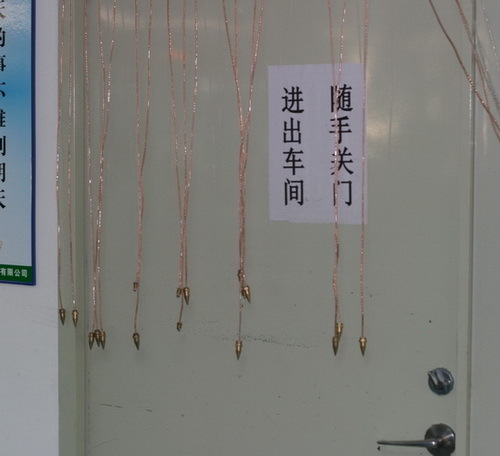 Did you get a chance to visit Sham Shui Po in Hong Kong? 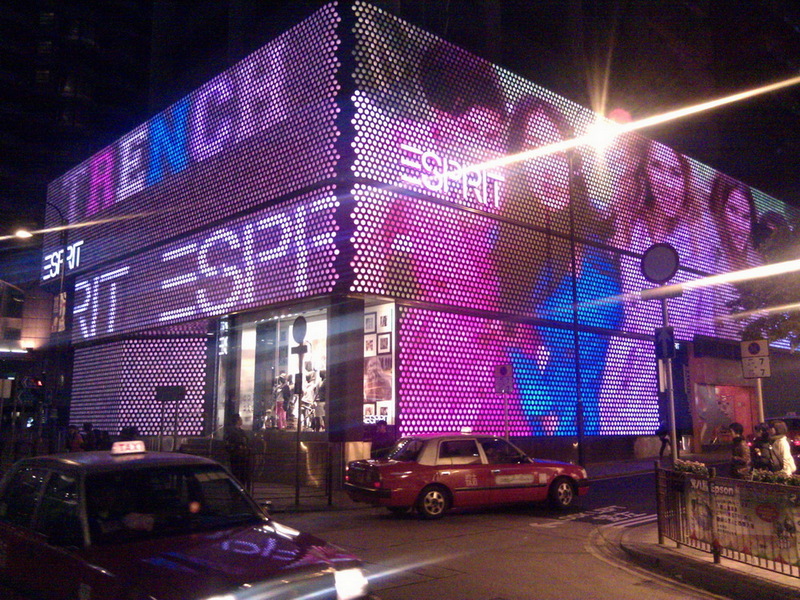 It was one of my favorite haunts when I lived in Hong Kong. I know MonoPrice has them. Reminds me of working for Amphn0L 1nterconect in Canada. 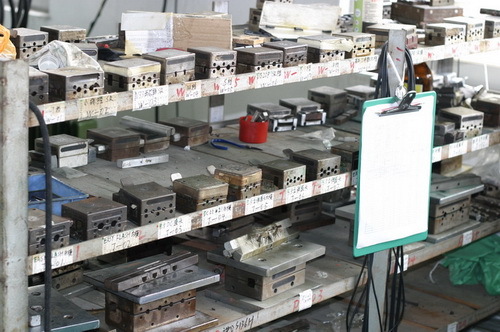 I still know by heart the dimentions of those plastic injection molds. I miss doing that. This is really, really cool. Still, though, one thing does worry me. The soldering line looks pretty clean and neat... except for the computer fan fume extractors. Are they filtered, or are they just fans blowing into the air? I find the idea of automatic strippers interesting. How can they work? Heh, if it makes you weary about an American company doing business in China, dont buy anything ever again. Also: dig the tin foil hat paranoia vibe youve got going. Oh, ok. So HK and China have pretty good QC. Makes me feel more confident in buying from them directly. A lot cheaper than SF, not to mention their $9 shipping + handling! I see you are in my neck of the woods (HK). Give me a holler, I owe you a pint. But you probably can't afford one. When I worked for a Telco, the cable vendors were required to use a Schleuniger stripper. 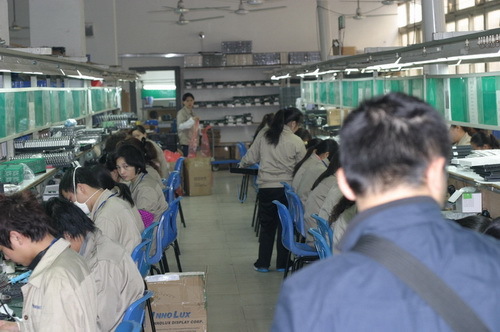 Interesting how more of the new products are being produced in China. Its a little disturbing, seeing everything coming from overseas mostly. 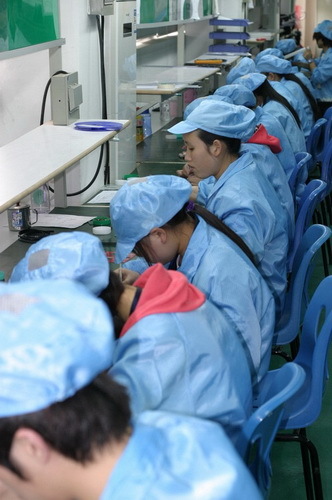 I do prefer to purchase products from countries where the work force and its people is treated like humans, and not slaves, with limited freedom.. Its sad that the electronics industry seems to being going that way..
how much cheaper is it to get it made in china? is it about half as much? The Chinese writing says please close the door as you enter or exit from the machine room. The building in Hong Kong was once own by a bankrupt Australian Business man who won the American Cup yacht race - Alan Bond. Very old building! (1980's). I'm forever having trouble with solder paste so can you explain the "icing on a cake" comment for solder paste? I couldn't tell what he was doing from the picture. BTW, I'm not very good at icing cakes either. It's not totally clear in the photo but what the worker is using is something like a miniaturized (and perhaps makeshift) pastry bag. OK, I see that now. Makes sense although I'm not sure my hands are that steady. I wonder if there are any "pastry bags" made for this purpose? Use a good syringe like from Zeph. Just use a good quality sandwich bag and cut a small hole in the corner. Wow, some interesting pictures. 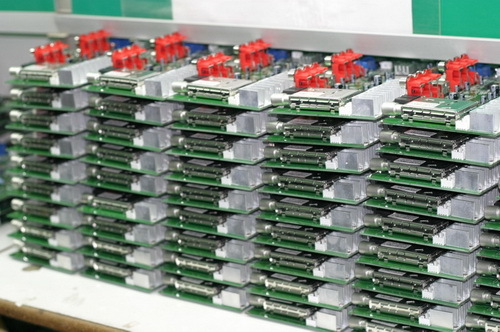 Don't mean to rain on your parade, but having been in American PCB manufacturing for 20 years, some of the pictures are disturbing. 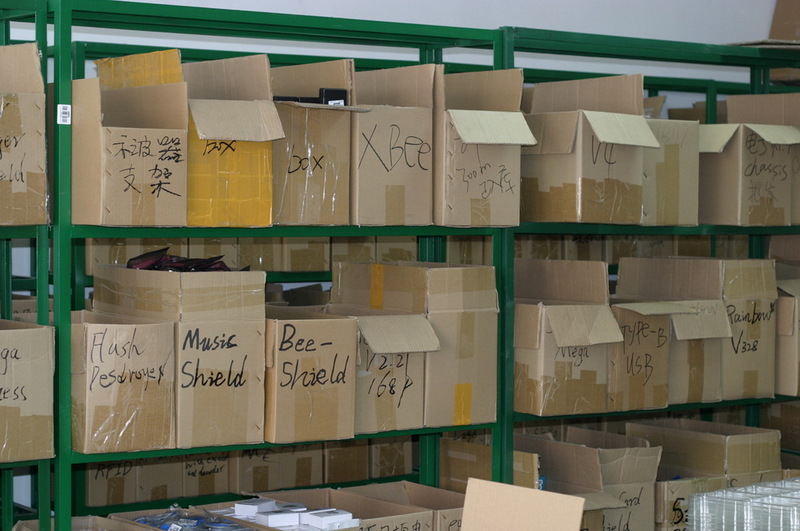 Some prove out the quality concerns that are consistent with Chinese manufacturing and why I am taking a harder look at the products I buy. I don't think I saw a single document for any assembly work going on. 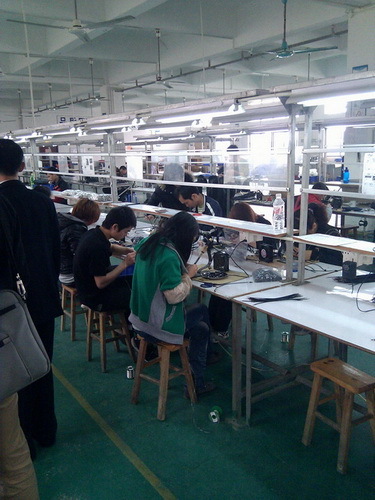 The one lady testing the small boards by hand is one of the real unheard truths about manufacturing in China. They will do the math to determine how many more bodies and cheap rates they can throw at something as opposed to buying the right tool. For example, while doing a rework job here in CA for a Chinese sprinkler controller manufacturer, the factory rep was asking where we got the "special and unique tool" to tighten the locking nuts because it was faster than his process. After advising him that the "Standard Crescent Wrench" we bought was $8 at Grainger, he thought for a moment, did some math, and said "I can just put 3 more people on it and get the same speed instead". I agree with you. What really scares me is their "ESD Protection". They can't seriously think pendants will help somehow. If they are conductive and tied to ground then anyone coming through that door will brush up against at least one of them and discharge any static electricity that's built up on them. Same for any carts and bins they're pushing through the door etc. Correct, but static is constantly being generated. So between the door and their chair, their body potential has changed and just walking generates a considerable amount of static build up. Holding three things with two hands is as easy as learning to use chop sticks. I learned how when I was a teenager and could afford a soldering iron, but no "third hand" thingy. 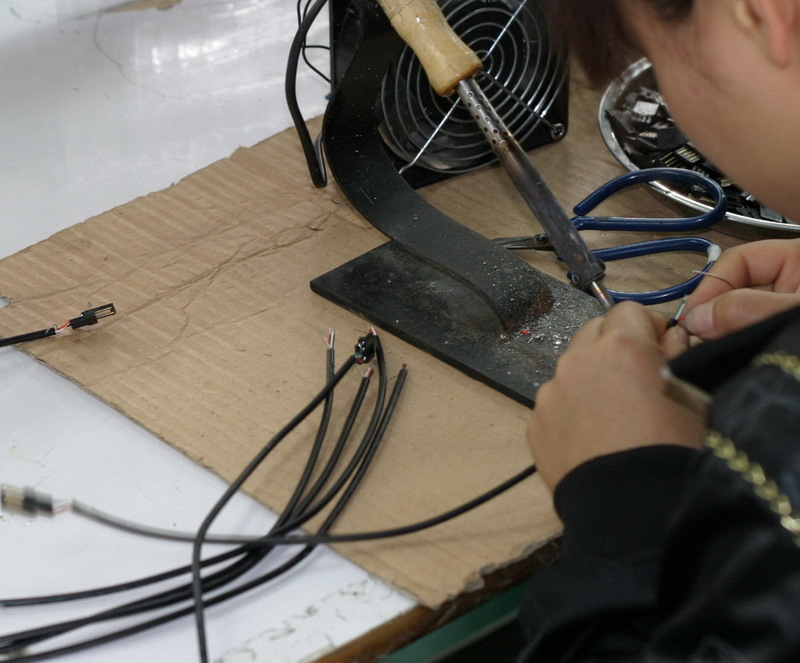 Soldering iron in my right hand, wire held between middle and ring finger, solder between index finger and thumb. I need a rig to hold my soldering iron like that. Looks like a great way to go for soldering some kinds of connectors. I dig how the hair protection nets are shaped like Chairman Mao hats. 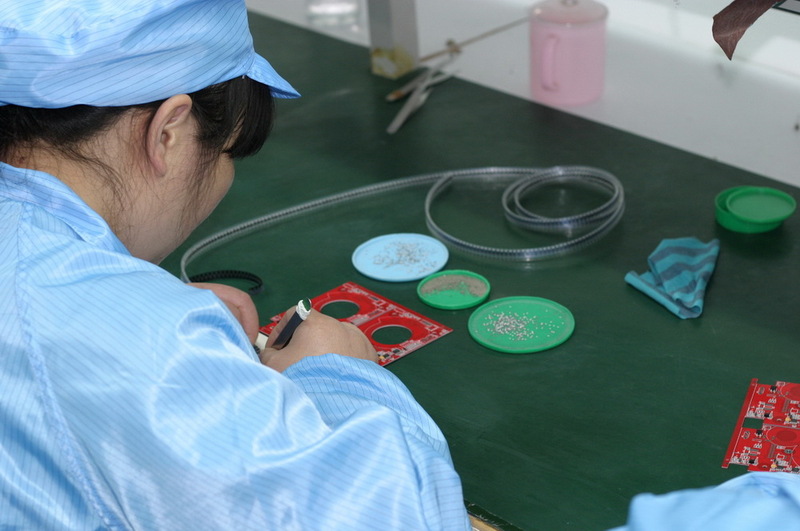 Wait a second: are you still applying all the solder paste by hand..? We still hold the stencils by hand and apply the solder paste with a common spackle/putty knife. yeah, thinking about it - when you're using masks by hand it would be faster than a robot dropping solderpaste. Even at high speed it takes ages if it needs to do a single qfp. And that reminds me of the radio station anouncing (on April Fools day) that the phone company was going to clean the lines and you should put a plastic bag over your phone to keep your house clean. 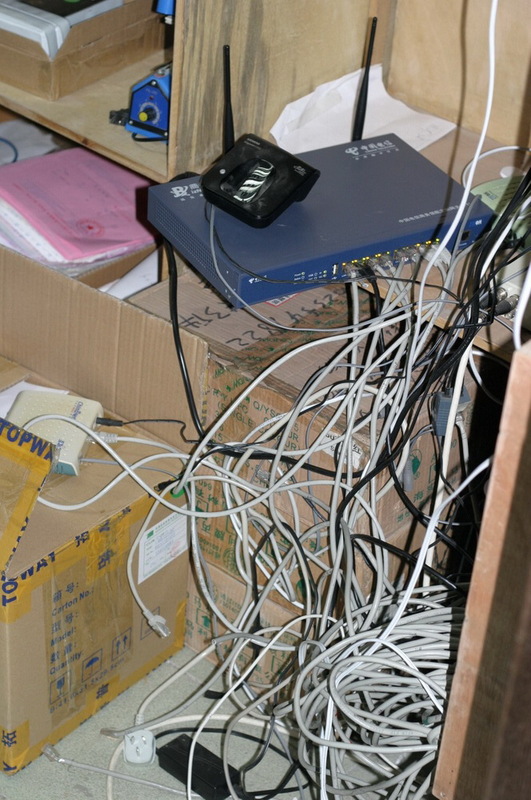 Hundreds of calls to the phone company complaning about the possible mess and the radio station getting in hot water. Wow, they do? And here I am, sending dirty ones and zeros into my otherwise clean LCD panel! I once (ashamedly and a long time ago) convinced a friend to straighten his computers cables "because the ones were pointy and might get stuck". 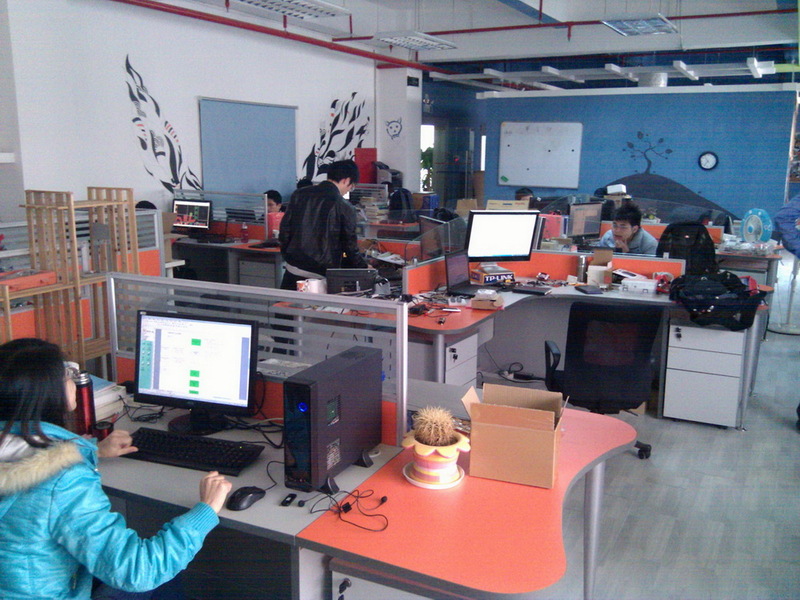 Wow the seeed office looks good. I like the shop, but customer service is plain weird. They have weird JST battery connectors, but they do not sell the receptacles. I asked, can you please offer/sell them? She just emailed back that "they can't just do that" - now that's how you lose customers. Widespread implementation would depopulate the Internet pretty quickly. The anti-ESD doorway curtain is a great idea. Get the first spark out of the way immediately, and everyone starts at a common potential. Sweet. That triple stack isn't too dissimilar from what you'd get if you designed a board to accomodate your RFM-22 Transceiver Breakout. Not that I can fathom why you'd do that instead of designing around the module.